Turkey Day [C6294] - $10.00 : Yarn Tree, Your wholesale source for cross stitch supplies. Cross stitch pattern by Pickle Barrel Designs. Gobble, gobble, gobble...it's "Turkey Day!" The clock has striked midnight, you have jumped in your car & are headed for a quick stop at the ATM. With your billfold now full & your arms empty of shopping bags...it's time to do some black Friday shopping! In the second design, a turkey stands above the saying, "Happy Turkey Day." Gobble, Gobble, Wobble, Wobble! 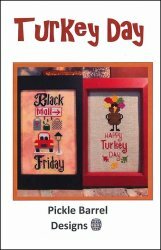 Stitch counts: Black Friday 26 x 72 & Happy Turkey Day 26 x 74. Black Friday was stitched on #8241 28ct. Autumn Fairy W/Silver from Fabric Flair.